Bureau MORBidee creates products and services that help raise awareness around death and dying in the Dutch society. We create these products and services for professionals in healthcare and funeral companies, but also for the general public and for (high)schools. Which kind of products and services? We created and published several conversation starters, that inspire and help people (young and old) to talk about subjects as loss, grief, death, dying, mourning, bereavement, end-of-life-care, palliative care, advance care planning, et cetera. Our games are: a dice game Praatstenen (‘Conversation Dice’), a conversation starter with cards called Kaartjes van Betekenis (‘Meaningful Cards. 50 questions which matter most’), a conversation starter about advance care planning called Oog in oog (‘Eye to an Eye. 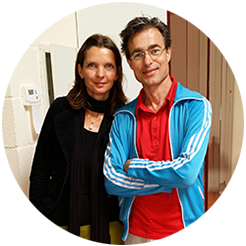 To talk about if and then’) and a game with philosophical questions, especially made for children and adolescents called ‘Heeft de dood een kleur? (‘Does death has a color? and 49 other philosophical questions about live and death’). Recently we added a conversation starter for people who lost a family, friend or collegue to suicide. This one is called ‘Levenslang?’ (For a lifetime?). To make conversations about death and dying as easy as possible, we created some beer mats. People can put them down at any table, whether it’s in a club, train, cinema or restaurant. We distributed 120.000 beer mats with the question ‘Shall we talk about death?’. On the other side of the beer mat, we published questions like What makes life worth living?, What should be on your tombstone?, What song would you like at your funeral?, What is dying well? and Do you fear death?. In 2018 we added another beer mat: ‘Shall we talk about the future?’ On the other side, we published some really serious questions: What do you hope for, if you look at your future?, What will support you, if you have to maken an important medical decision? or What should I know about you, if I had to take care of you? A mobile Before I Die Wall? It’s not only because it rains a lot in The Netherlands, but we very much aspired an indoor Wall with the famous phrase ‘Before I Die I Want To…’ that we could transport to different (indoor) places. So we designed and constructed that Wall. We use it at conventions and conferences, or at schools. 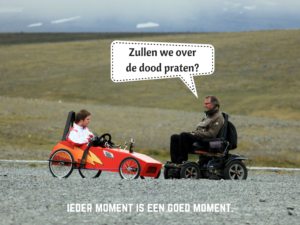 In March 2016, we started a grassrootsmovement/social media campaign using the slogan ‘Zullen we over de dood praten? Ieder moment is een goed moment’ (‘Shall we talk about death?/Now is as good a time as any.’). We designed about 50 advertisements, and we asked our followers and friends on Twitter, Facebook, Instagram, LinkedIn and WhatsApp to help us, to spread those advertisements during a certain period (7 maart – 1 april). About twohundred people assisted us, so we reached about a couple of 10.000 people in a small period of time. We repeated the campaign in 2017 and 2018, although we used orther slogans (‘Do you have a minute?’ and ‘Say it now’). Lots of people find it very difficult to keep contact with someone who is diagnosed with cancer or an other incurable disease. To help them, we created some greeting cards. 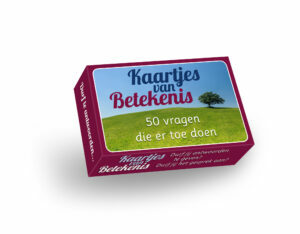 We have a special website for those cards: www.kaartenvanbetekenis.nl. In 2018, we launched a special collection cards about grief. 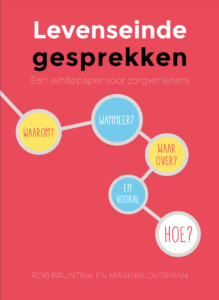 In 2018 we published a white paper about end-of-life conversations (‘Levenseindegesprekken’ in Dutch), to help professionals in palliative care to start meaningful conversations with their patients. We explain the importance of having those conversations, and present some easy, practical ways to help them. Part of this book is a Flowchart Communication Palliative Care. With this Flowchart, any professional can find out which patients are qualified to have end-of-life conversations. Yes, we operate in the Netherlands. Or Holland. We talk Dutch. Just like in Belgium, although, they speak it more beautiful. We have 17 million inhabitants. A couple of million of them live in Amsterdam (Ajax!) or Rotterdam (Feyenoord!). We live in a less known part of Holland, the eastern part (Twente! ), close to the German border.